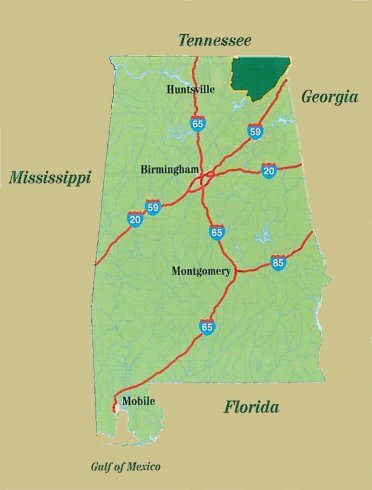 Jackson County is uniquely situated in the Mountain-Lake Region of Alabama near key major markets and is located one hour from Chattanooga, TN, 45 minutes from Huntsville, AL, and two hours from Birmingham, AL and Nashville, TN. The scenic beauty of Jackson County is truly remarkable with its picturesque mountains, vast natural lands, scenic waterways and an abundance of caves, springs and rocky bluffs. The county’s multi-modal transportation infrastructure, which includes access to interstate highways, mainline rail service, and navigable waterways, allows business and industry to reach customer markets quickly and efficiently. With a strong K-12 school system, as well as the leading technical education program in Alabama and proximity to major colleges and universities, Jackson County offers a highly skilled workforce, along with the resources to provide advanced employee training for businesses/industry in the county. Jackson County’s business costs are very competitive and are enhanced by available local incentives to offset additional expenses for businesses in the county, and the cost of living is 13.5% lower than the national average. Crime rate is 25% of the national average. TVA offers competitive electric rates for manufacturers and has achieved 99.999% reliability every year since 2000. Manufacturing has a very strong presence in Jackson County, with approximately 5,000 workers or 25% of the workforce employed in the manufacturing sector. The Earnest Pruett Center for Technology (EPCOT) is the number one high school technical program in Alabama. Northeast Alabama Community College has been hailed as one of America's Top Community Colleges. TheBestSchools.org, "2013: No. 20 Community Colleges in the US;" CNN Money, "2012: No. 15 Community College in the Country;" and The Aspen Institute, "2013: The Top 10% of all Community Colleges in the nation." Unclaimed Baggage, Alabama’s number one retail tourist destination, sells unclaimed baggage attracting treasure hunters and casual shoppers from all over the country.